Cost: $29-$39 – FREE Shipping! About this Virtual Run: The Run of the Dead has RETURNED! 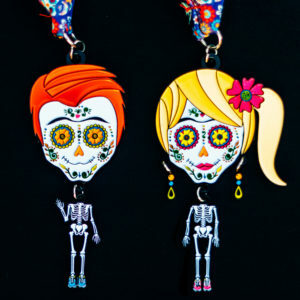 Following 2016’s Run of the Dead (male skeleton) and 2017’s ReRun of the Dead (female skeleton), 2018’s Return of the Run of the Dead 5k/10k/Half Marathon features your choice of a boy or girl sugar skull medal, or BOTH if you’d like to complete the family! Like past years’ medals, the skeleton bodies dangle below their oversized heads, and the girl medal has two dangling earrings as well. These 4″ medals are slightly smaller than the ones from past years, and the whole family looks amazing together. Run or walk whenever and wherever you want to earn these colorful Day of the Dead themed medals while supporting a charity that serves nearly 4 million kids and teens annually, providing safe, affordable places for children ranging in age from 6 to 18. About the Charity: Boys and Girls Clubs of America provides a safe place for kids and teens during critical out-of-school time. This charity offers life changing programs and services to youth across the nation and on U.S. military installations worldwide. They seek to enable all young people, especially those who need them most, to reach their full potential as productive, caring, responsible citizens. When you give to Boys & Girls Clubs of America, you create opportunities for young people who might be heading to their Club for a game of basketball, a hot meal or a safe place. But, with your help, they receive so much more than that — academic support, leadership opportunities, workforce and college preparation, healthful skills and lifelong mentors. A portion of the proceeds from this virtual race (at least $5 from each registration) will be donated to Boys and Girls Clubs of America. For more information about this charity or to make a direct contribution, please visit BGCA.org.